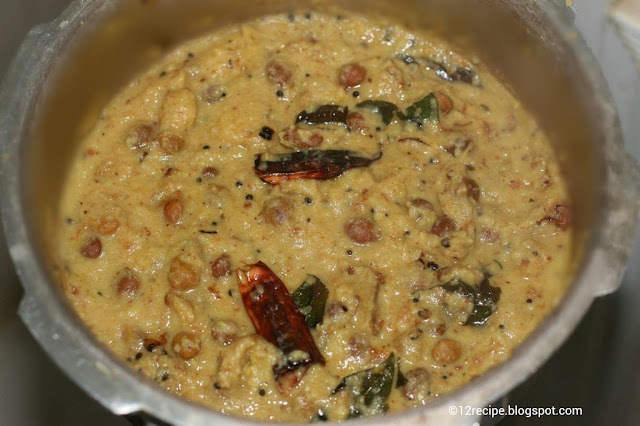 Kootu curry is one of the most delicious vegetable curry in Kerala. It is one most import item in Kerala sadhya menu. Even kootu curry itself with some steamed rice gives a sadhya effect. Soak chick peas overnight in water. Pressure cooks it until done by adding little salt and water. Cook raw banana, yam, garlic and green chilly with little salt and water for 1 high whistle in a pressure cooker. Mix it with above chick peas. And put the flame on. Splutter mustard seeds and add curry leaves and dry red chilly. Add shallots chopped and coconut grated in simmer flame. Sauté it until crisp and golden in colour. Switch off the flame and suddenly mix it with turmeric powder, red chilly powder and pepper powder. Add it in to the curry and mix well.